After a long school year, rewarding students with a field trip to Adventureland Amusement Park is a great experience that they’ll appreciate forever. Adventureland is Long Island’s favorite amusement park and number one destination for school group outings since 1962. Students and teachers keep coming back for their school group events and class trips. Here are some fun reasons why you should also visit Adventureland for your next school trip. Adventureland located in Farmingdale, New York is filled with wonderful rides for guests of all ages. Helicopters, Kiddie Carousel and Alfie Express are always favorites for younger children. The classic and exciting bumper cars and the heart pumping Turbulence Coaster are great options for adventurous teens and adults. And those are just a few of the many awesome attractions to entertain you. At Adventureland we also save you the trouble of worrying about bringing food. We offer group food packages that can keep students’ stomachs full and satisfied throughout the day. We can also accommodate vegetarians and individuals with food allergies. Guests can also feel free to choose among our wide selection of snacks and foods from our food court or snack stands located throughout the park. Adventureland can host school groups outing of any sizes big or small. We can comfortably accommodate groups from 20 to 4,000 guests and provide them with the best amusement park experience. We also offer exclusive park access for private group events to make your school group trip even more special, intimate and memorable. Please contact our Group Sales department at 631-494-2557 for more information about the exclusive Adventureland theme park experience. Aside from fun and thrilling rides, delicious food packages and accommodations, we also offer fantastic discount rates for school group trips. The larger the school group the better the savings you and your school can enjoy. School group events are better at Adventureland. We specialize in fun and exciting rides and attractions that students of any age will love and remember. 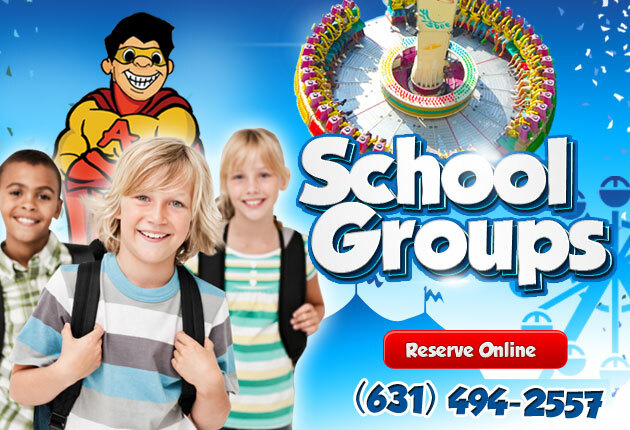 Reserve your school’s next group outing by calling 631-494-2557. We offer discounts for larger groups so be sure to reserve your Adventureland school trip today! Don’t miss out on all the fun and action at Adventureland and book your school Group or Camp Group trip today!